Journalists cannot complain about the lack of data when they have to report about our environment. Scientists have been collecting information about our environment in so many forms, for so many years, that dealing with quantity is more of a problem than suffering from scarcity. For more on data of climate change coverage around the world please check the tracker established by Professor Max Boycoff, at the University of Colorado. One can find amazing historical series on oceans surface temperature, carbon monoxide concentrations on the atmosphere, the biomass density on a forest or the status of the sea ice coverage of the Arctic, among many other indicators. Even more interesting is to observe that the scientific institutions and the researchers themselves are the leaders of opening the data for the public. Much less inspiring, though has been the trend of media outlets of cutting whole news-desks of science and environment. 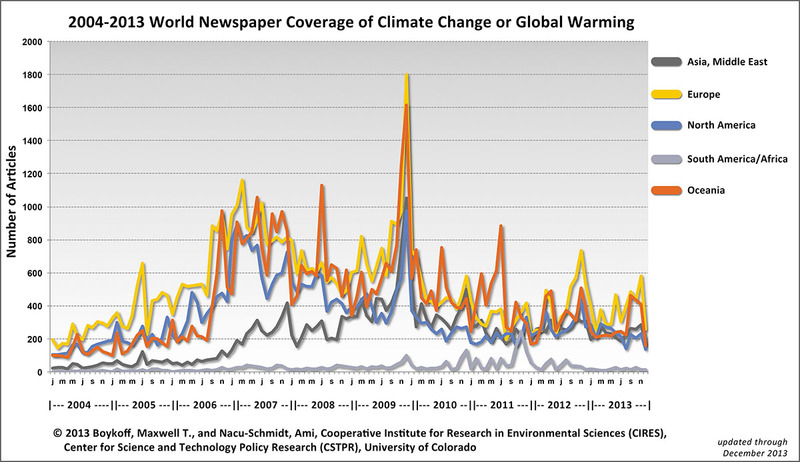 Those who believed that climate change had changed the coverage forever were wrong. The interest of mainstream media on the subject had reached its peak in 2009, during the controversial negotiations at the Copenhagen Climate Summit. See the image on the side. The story of the Geojournalism.org starts with a group of environmental journalists from different countries who were covering conferences like Copenhagen in 2009 and felt that a new approach for the issue was needed. Editors and the public seemed to have lost their interest with a hunch of disappointment in face of so many failures on environmental politics. At same time, measurements by satellites and researchers on the ground have never stopped producing relevant information for our everyday life. Inspired by the freshness of the data journalism movement, we realize there was space for those who deal with the geodata and that using principles of design and data visualization could remake the bridge to the public’s mind. This has led to the alliance between journalists and other professionals, mainly programmers, designers and data analysts. Geojournalism.org is based on an experience of many of these professionals on building their platforms of information both on prestigious media outlets and as independent knowledge brokers. The project is above all and attempt to increase the number of professionals familiarized with the geodata and capable of coordinate initiatives of interactive visualizations . We tried to not join only the tools that can be deployed, but also to convey a broader knowledge within tracks such as data, maps, design, visualization, crowdsourcing, among others. We hope that the materials will keep being improved from now on and new tutorials will be aggregated. Geojournalism.org is part of the portfolio of InfoAmazonia, a multidisciplinary team hosted in Brazil working to create useful applications for environmental coverage. The online toolkit was created in partnership with Internews’ Earth Journalism Network and the Flag It! Project.